On day seven of the Gardens in Spanish Culture tour, we rock (sorry for the pun) into Ronda, perched scenically on the edge of this canyon called El Tajo. A highlight of our visit to the Palace of the Marqués of Salvatierra will be, for me at least, the 200-year-old Pinsapo in the garden. The sixteenth century building, renovated in the eighteenth century, should provide the perfect backdrop to the 'National Tree' of Andulasia (the name given to this southern region of Spain). 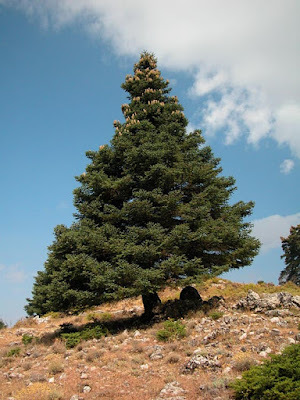 The Pinsapo is a fir tree, Abies pinsapo, sometimes also called the Spanish Fir or even Hedgehog Fir (a reference to its overall form when young I think). The botanical epithet pinsapo is a corruption of the Spanish local name, Pinapares. Its native habitat is in southern Spain and Morocco, but you can see it in parks and gardens in southern Australia. A cultivar with waxy blue leaves, called 'Glauca', is widely grown and there are others such as 'Fastigiata', 'Pendula', 'Argentea' and 'Aurea' (the last two leaf colour variants). Pinsapo was discovered in 1837 by Swiss botanist Edmond Boisser. He discovered it in the mountains of Andalucia, in the south of Spain, which look a little like this. It's a fir, Abies, because the needles are soft and flattened, and attached to the stem by a spherical 'sucker' (when you remove the needle the stem is rather smooth). 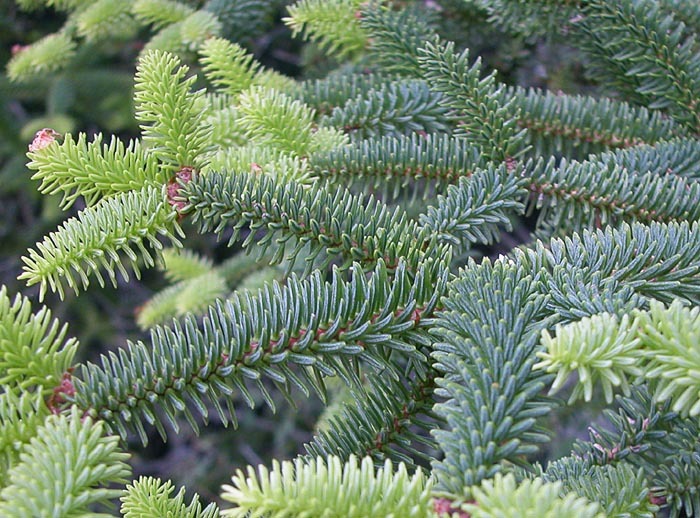 A spruce, Picea, on the other hand has stiff, pointy needles with a knobbly bases that extends along the stem and remains as a bump when you remove a leaf. As firs go, the Pinsapo has relatively short needles. Although there are no firs in this picture of the Sierra Nevada, limestone outcrops in the nearby Sierra Bermeja and Sierra de las Nieves are home to two of the three remaining populations of Pinsapo in Europe (the third, according to Kew's Plant, is on serpentine rock in an unprotected area). Across the Mediterranean in northern Morocco, there are two distinct varieties found naturally. In the geological record there is evidence of Pinsapo around the Mediterranean during the Tertiary period, from 65 to about 2 million years ago. The climatic changes occurring during the following million years, including the last major ice age, were not as intense in Andalucia as elsewhere in Europe. In the mountains outside Ronda, not far from the Marqués' garden, is part of the Pinsapos remaning strong hold. Having survived this major climatic event its existence became precarious over the last few centuries due to extensive land clearing. In 1964 there were just 700 hectares of pinsapo forests remaining. Things have improved over recent decades. With replanting and careful management, there are now over 5000 hectares. Although more secure, the remaining European populations of Pinsapo are susceptible to fire, goat grazing and most recently a fungus, Heterobasidium annosum. It's thought more recent changes in the climate may well have weakened the species' resistance to the fungus. So Pinsapo may have survived the last ice age and the axe, to succumb to the side effects of human-induced global warming. Given a chance, the Pinsapo grows to 30 metres tall and, as we know from Ronda, can live for at least 200 years. Don't panic though, baring fire, fungus and feral animals, you may have another 100 years or so to visit the Marquis' tree: word is (Gymnosperm Database), the oldest specimens are 300 years old. Images: The pictures of Ronda are from 2008, my last visit. Those of the Pinsapos are copied from the Gymnosperm Database site, both from trees growing in nature and taken by Jose Angel Campos Sandoval. Good information on plants and flowers that gives beauty to indoor and office space. Buy online plants, flowers,bouquets with free delivery for your loved one.